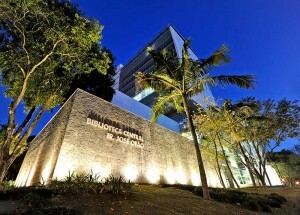 Considered one of the most technologically advanced libraries in South America, the Irmão José Otão Main Library covers every area of knowledge, offering books, journals, databases and all kinds of educational support materials (including materials for the visually impaired), thus contributing to the personal, scientific, technical and professional development of students and the community. The library provides an environment conducive to studying, with rooms equipped with computers, wireless internet access, special lighting, group and individual study rooms, reading areas with natural light, and an external study room. Learn more about Irmão José Otão Main Library accessing its Institutional Folder. Center for Documentation and Cultural Memory (DELFOS) website.